Starting next year, Star Trek fans will be able to explore strange new world, seek out new life and new civilizations, and then boldly go to Quark's for a drink. German publisher Gameforge has announced a free-to-play, browser based MMO called Star Trek: Infinite Space, based on Star Trek spin-off Deep Space Nine. Keen Games, whose previous work includes Nintendo Wii and DS versions of the Secret Files games, is developing the game, which is scheduled to be released in the summer of 2011. Gameforge said that it chose Keen because the developer had a "strong history of making outstanding games." Keen's creative director Antony Christoulakis said that he was excited to be working on the game, as Star Trek was a franchise that every sci-fi fan would love to be a part of. Infinite Space will apparently offer an "immersive experience" and a "gripping story," and Christoulakis said that the game would make fans proud. 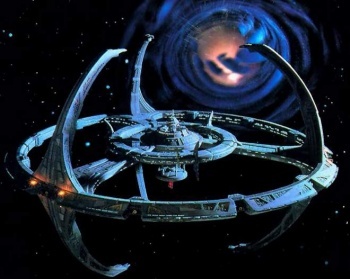 Also working on the project are Michael Okuda, who worked as the scenic art supervisor for the various Star Trek TV shows, and his wife Denise, who worked as a scenic artist and video supervisor. Michael Okuda was also a consultant on Star Trek Online and the pair wrote the Star Trek Encyclopedia, one of the foremost reference books about the Star Trek world.